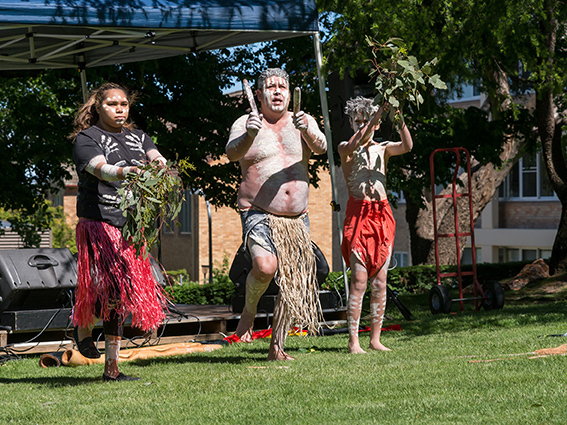 An Indigenous Education and Community Open Day at the UNE Campus. What a Day!! Visitors flocked to the event and a dozen schools sent around 300 students to attend the day. Set up started early and it took all the staff and a large group of volunteers to make this day the huge success that it was. There was something for everyone; live music, art, dancing, markets stalls, workshops, talks, short films, campus tours and kids activities. Attended by well over 1000 people the Oorala 30 Open Day was a huge success. 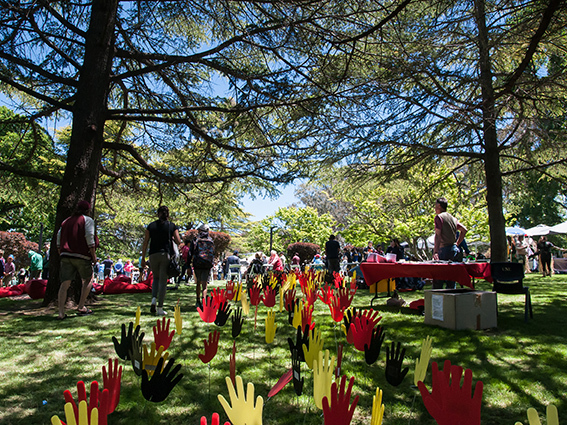 Crowds of visitors followed the ANTaR Sea of Hands installation as it wove from the Oorala Centre through the trees to graduation walk. 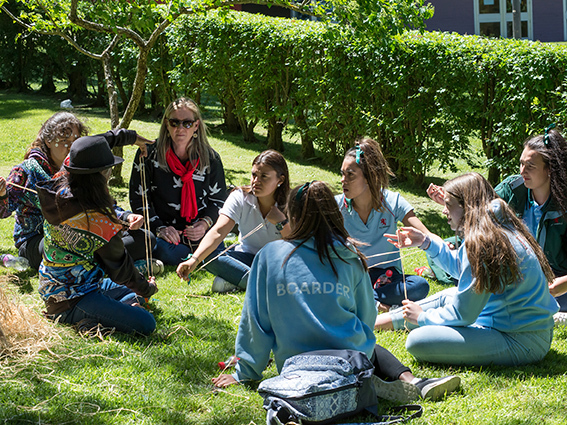 Many stopped at the Weaving Circle with Dolly Jerome, learning to weave combined with learning about culture or to paint a community canvas with artist Lloyd Hornsby. From the Sea of Hands children could be found comfortable on red bean bags absorbed in a dream time story telling. At the main performance area stalls featuring Aboriginal and Torres Strait Islander craft were set up leading to the main stage for a fabulous line up of the day’s entertainment. A Welcome to Country began the day with Kristian Sternbeck and the Biruban Dancers. Followed by the Duval Deadly Dancers, a colourful display of youth adding cultural awareness to the day along with a popular performance of Paws Up by Backtrack. 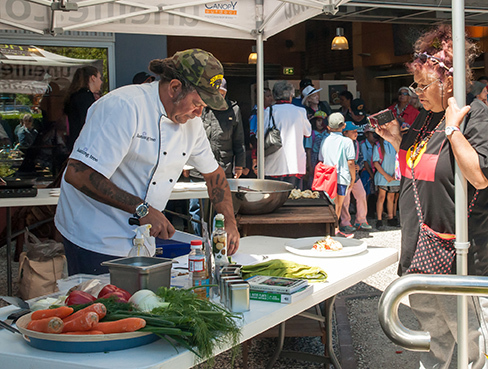 Meanwhile at the Oorala Aboriginal Centre, Australia’s highest acclaimed Indigenous Chef, Clayton Donovan offered the audience delicious and tempting samples of his Cauliflower and Macadamia Salad with Warrigul Greens cooked on the BBQ. Clayton believes, “Concepts and ideas are changing about the role of bush foods in modern cuisine. Everyone can now access the knowledge to use bush foods, and to see it and taste the results.” Clayton spent the day chatting and creating a wonderful fusion of flavours. Next door to Clayton’s Cooking Demonstrations, the public could wander the Oorala Art Exhibition, watch a slideshow of Oorala’s history or a film about the importance of language, Big Boss: The Last Leader of the Crocodile Islands, directed by Paul Sinclair or attend a talk on Indigenous Oral History by Dr Lorina Barker. Out under a huge pine, UNE Archaeologist, Dr Mark Moore engaged groups in making and using stone tools to achieve a variety of tasks, and to reflect on the effectiveness of stone technology when it came to cutting up the food for dinner. Some chose to make spears another important tool for the hunter gatherers of previous times. Amongst the crowds over ten schools, local and regional, attended the Oorala 30 Open Day. The painting, storytelling and craft activities engaged many of the children and young adults throughout the morning and into the afternoon. Food was not forgotten with a free sausage sizzle put on by Oorala, UNE Life BBQ and Mak’s Turkish Gozleme’s mixed with the aroma of coffee . The much anticipated performance by Isaiah Firebrace was an immense crowd pleaser. Isaiah loved the audience and had them singing and dancing while he performed his favourite songs. He then spent just as long happily getting his photo taken with the long line of fans much to the joy of the adoring crowd. The weather stayed sunny as the beautiful vocals of Roger Knox backed by Bobby Knox on guitar brought the day to a close. The Oorala 30 Open Day was about celebrating! The achievements in education and student support of the past 30 years are massive. 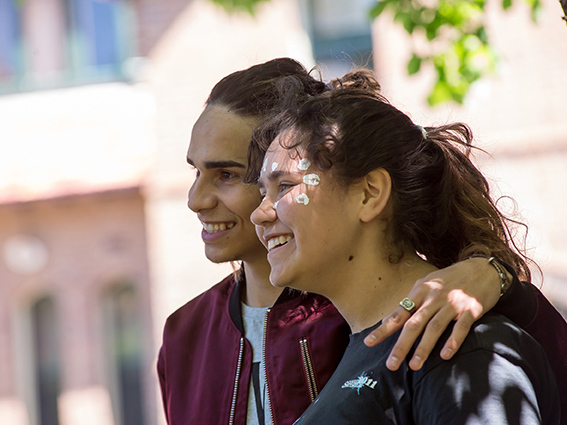 It was important to showcase the success of the Aboriginal and Torres Strait Islander students and educating current and future students about what Oorala is about. Oorala means more than this it is about supporting our community to enable them to successfully achieve their education goals and prosper in an inclusive environment at the University of New England.